In June of 2017, a 400-year-old white pine tree, 36” in diameter, fell during a windstorm in Waupaca, WI, crushing an outbuilding on Brent's parents’ property. We persuaded his Dad to have the lumber milled into 6 x 6 timbers. He hired a portable mill and in November we milled the pine along with several other trees that came down in the storm – 3000 board feet in all. Right around the time when the tree fell, we were on our way to Grand Marais, MN to visit North House Folk School to consult with them about their timber framing courses. There we learned that white pine, the same species of the tree that flattened Brent's parent’s garage, was considered the ideal timber framing material. We had been thinking about the sculptural possibilities of timber framing ever since we fabricated a timbered structure for the artist Fo Wilson at Lynden Sculpture Garden in 2015. So when we were approached about doing a piece for Sculpture Milwaukee, and the organizers showed interest in the Fo Wilson structure at Lynden, we began sharpening our chisels. We have been fascinated for some time by the geometry of failing buildings and structures, which is exhibited most demonstrably in the neglected farmsteads of the rural Midwest, where partial ruins of barns and outbuildings are a familiar sight. Succumbing to time and the forces of nature, wooden structures lean, sag, and buckle, creating new geometries that contradict their original intended forms. The results are sometimes comical, sometimes bizarre, and always infused with the emotional resonance of a lost way of life. For Sculpture Milwaukee, our piece, Skew, is a sculptural interpretation of one of these failing structures. Using the wind-downed pine, we will utilize traditional timber framing techniques to construct a half-scale shed that is severely leaning in two directions. Placed on a base that leans similarly, the result is an uncanny distortion of a familiar form. This distortion, however, is not due to failing joinery or dilapidation, but is instead carefully and sturdily constructed in this configuration. Timbers are parallelogram in section and visible joinery is distorted according to the skewed geometry of the structure. The alteration is, in fact, digital in origin – it was first laid out using 3-D modeling software, and digital tools were used to skew the structure in multiple directions. The resulting deformations have a distinctly digital feel that is alien to our normal physical environment. Translating this digital language to age-old methods of rough, hand-built construction, the result is an uncanny collision of past and future that is both familiar and unsettling. An image from our 3-D model of Skew. Left to right: A 3-D proposal sketch of Skew; timber-framing experiments with compound angles. A lineage of sculptures leading to Skew, from our portfolio (left to right, top to bottom): A Tenuous Framework, post-weathering, on the Ripon College prairie; Vignette, a scale-model and film set; Reaction, a house with no foundation; The End of the Line, an aged, framed picture of a scale-model farmhouse, photographed in situon a frozen Wisconsin lake. In April 2016, we were invited to participate in the John Michael Kohler Art Center’s ExAir program. For this, we built a full-scale version of the porch from a small model farmhouse that we originally created for an installation titled Farmsteadthat was shown at INOVA Gallery (now closed) in 2006. The farmhouse has since become an icon in our work, and an epicenter for ideation. The full-scale version of the porch was built as a “blank” structure, devoid of references to real building methods, and reduced to simple white geometry. This blank porch represents the absence of a connection to the ancestral homestead, and the unsettling feeling that accompanies this dislocation. Toward the end of the residency, we used the porch as a film set for The Inhabitants, an ongoing film project in collaboration with Milwaukee filmmaker Tate Bunker. A Tenuous Framework is a sculptural installation originally built on a prairie restoration site at Ripon College in Ripon, WI. Composed of a few open stud walls beginning to define the shape of a 19th century farmhouse, the building process continued throughout its duration, but remained incomplete. Functioning primarily as an outdoor sculpture or an object of curiosity for users of the nearby trails to contemplate, it is also set piece for our ongoing film project, The Inhabitants. In Spring of 2015, the structure was slated for destruction by fire during an annual prescribed prairie restoration burn. However, wet weather conditions that year prevented the burn, so the structure remained in place until Spring 2016. The 2016 burn successfully altered the installation, and also served as a climactic moment in the film, transforming the sculpture into its final form - a charred remnant and a meditation on effort in the face of adversity and inevitable demise. By October 2016, A Tenuous Framework was deinstalled from the prairie and relocated to the Madison Museum of Contemporary Art in Madison, WI for inclusion in The Wisconsin Triennial. In Fall 2018, the structure was again on view at the Rockford Art Museum as part of the exhibition Dwellings. Created for Cargo Space, a collaborative exhibition organized by Christopher Sperandio, TEA (the Transitory Experiment in Association) is a pop-up performance and social event that encourages close personal exchange between strangers in an art context. Acting as hosts and project coordinators, McCaw and Budsberg are the only participants consistently present at all of the TEA gatherings. By surrendering control of the list of invitees to the guests themselves, unforeseen and otherwise unlikely configurations of guests will find themselves sitting together and socializing. Although the project begins with a group of artists and arts professionals, it will evolve to include participants of various and unpredictable backgrounds. By providing participants with a platform to interact with community members outside of their ordinary circles of association, the Transitory Experiment in Association seeks to break down existing social barriers, and foster opportunities for new connections, collaborations, and ideas. Hosted by the Chipstone Foundation, The Museum of Rooms is a project for Object Lab, an annual research project and think tank for a group of nine undergraduate students from across the country. In 2015, Chipstone invited us to curate a group of four Milwaukee artists to re-imagine a small room in a house to act as creative context for objects in their collection of early-American and British objects. Our room, entitled Study for a Character, is both an installation and a set design for our ongoing film project, The Inhabitants. Working in collaboration with Milwaukee filmmaker Tate Bunker, The Inhabitants is a suite of short films and video installations in which we assume the imagined personae of our immigrant ancestors in order to explore our subjective perceptions of a shared American past. Working without a script, we improvise with site, costumes and carefully chosen or constructed props to unearth an emergent narrative. SPACES Gallery is not named after the lumber and masonry that make up its structure, but for the void it contains. With white walls and minimal furnishings, the art gallery seeks to disappear in order to isolate and amplify the work it exhibits, yet its physical structure is always present. In An Inventory of Absence, we examine the archetype of the art gallery, referencing techniques of architectural representation to deconstruct and recontextualize our experience of space, revealing the void as a compelling yet unattainable ideal. Goldwell is an artist residency near Beatty, Nevada on the border of Death Valley National Park, adjacent to the ghost town of Rhyolite, Nevada. In December 2012/January 2013, we were in residence there to continue our photographic work, focusing on the historic images people use to gain insight into past lives. Using the natural and cultural landscape of Death Valley and surrounding areas as a context, we created a series of photographs depicting ourselves as nineteenth-century characters struggling to come to terms with a harsh and alien environment. From the perspective of these Midwestern farmers, the desert represents a kind of unconscious dystopia, a manifestation of the fears and repressions of the Midwestern settlers. The images depict hopeless efforts to force a land of perpetual drought to bear fruit. The Black Frame Gallery, a project of Michael Kautzer and Epitecture Studio, is a "world-class exhibition space mounted on one's back." Our project, False Burden appears to be a heavy weight that the carrier of the Black Frame Gallery must bear, and by virtue of the scaled down gallery space, it also reads as a miniature of a massive monument. A tiny placard on the wall of the main gallery reinforces this scale shift; its text is too small to read. In actuality, False Burden is a hollow facsimile of a real rock which has been scanned with a 3-D scanner, enlarged by a factor of 10, and printed using a 3-D stereolithographic printer. It has then been sliced into two sections which occupy the exhibition spaces. The weight of the object is illusory and its surface retains the color and texture of the material used in 3-D printing, providing a clue to the object’s inauthenticity. The rock used as the source of the 3-D scan has its own significance. 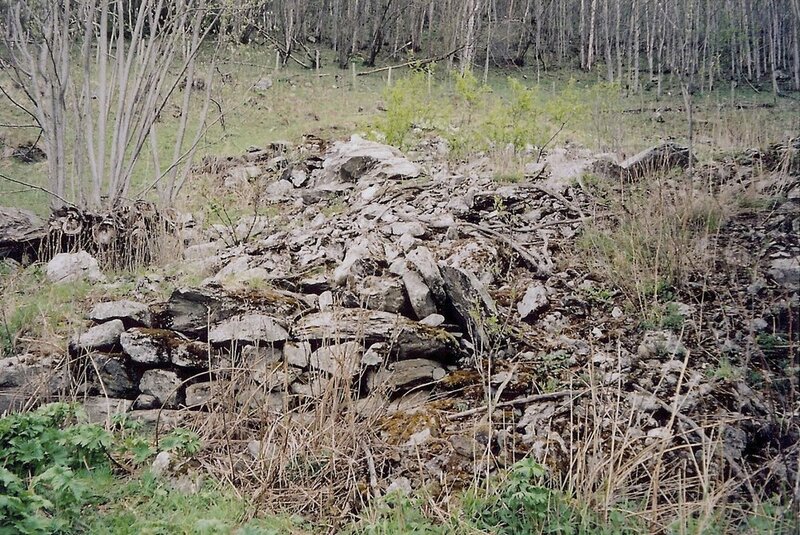 It is a remnant of the foundation of a farmhouse in Gausdal, Norway, formerly occupied by Budsberg’s ancestors who immigrated to Wisconsin in the 1870’s. Representing one of the few artifacts from the old country, False Burden is a futile attempt to enlarge, amplify, and analyze an ancestral object and coerce it into revealing information about the place and time from which it came. It represents an irrational desire for the object to become transparent, disclosing secrets of the past. The result contrasts the ancient technology of placing stone upon stone to form a foundation with the complexity of modern stereolithographic printing. Ultimately, both technologies fail to provide insight into the past, and the stone remains mute. States of Matter is a book of photos compiling the images we produced during our performance Coal-and-Ice at Lynden Sculpture Garden in February 2011, and also our residency with the Center for Land Use Interpretation in Wendover, Utah. Both series' central characters are two 1800's-era pioneers in an endless search for a sense of place within a void...the salt flats of northwestern Utah, and the snowy expanse of a Wisconsin winter. The Center for Land Use Interpretation (CLUI) is a Los Angeles based organization that is "dedicated to the increase and diffusion of knowledge about how the nation's lands are apportioned, utilized, and perceived." We were in residence at their Wendover, Utah facility in May 2011 in order to shoot photographs in the salt flats region and surrounding areas. At the time, our sculptures and site-specific installations often incorporated small-scale Midwestern farm buildings that were amalgams of several remembered buildings from our combined rural histories. Parallel to this work, we began a series of photographic studies of these miniatures exploring the perceptual effects of decontextualizing and recontextualizing them. The camera helped to create an ambiguous sense of scale as a result of the proximity of the lens in relation to the miniature, combined with the use of unfamiliar landscapes that juxtapose the Midwestern vernacular of the buildings we built. In developing this series in Wendover, we were confronted with an unexpected situation where the usually hot, dry, desert-like salt flats were flooded, due to late spring rains, with about 4" of water. This new landscape led us to a photographic exploration of the 1800's-era characters we conceptualized for a performance at Lynden Sculpture Garden in Milwaukee, WI earlier that year. A sampling of the resulting photographs are compiled in the photo book States of Matter, described in the post above. MKE<->LAX hosts residencies and public programs that "investigate cultural exchange between two American regions, with Milwaukee and Los Angeles as epicenters." During our residency in May 2010, we gave a lecture entitled, House Work: Peeling Back the (Tiny) Layers, which gave background and context to our work with miniature architectural forms. The WhiteBoxPainters are a four-member performance art group including Brent Budsberg and Shana McCaw (Milwaukee, WI), Harvey Opgenorth and Mark Escribano (Los Angeles, CA). Wearing white painter's coveralls marked with the WBP logo, the performers assume the role of contractors or city workers, intentionally blurring the lines between public performance and municipal labor. The white box has come to symbolize both a basic building block of our physical surroundings as well as a challenge to the traditional white box of the art gallery. All images and text on this website are copyright protected. They may not be published in whole or in part without the express permission, in writing, of the artists.